A couple months back Wolfgang Puck opened what is likely his smallest restaurant. 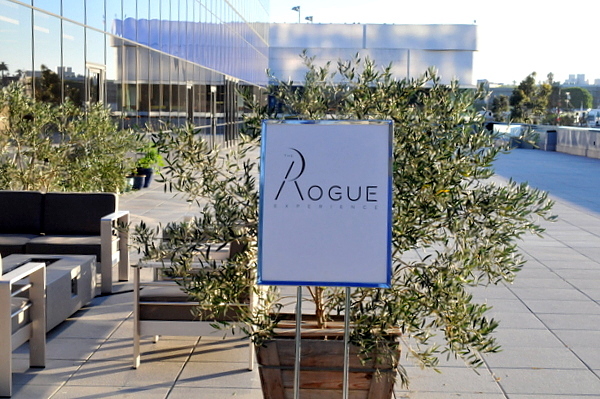 Tucked away in a hard to find corner of the Pacific Design Center, The Rogue Experience serves as a test kitchen with executive chefs from across Puck's global empire coming for week long stints. The space provides an opportunity for the chefs to break out of their comfort zones, experiment with flavors and dishes that might not fit their day jobs, and exchange ideas with their peers. When guests first enter the test kitchen, they are greeted by host David Evers who invites the diners relax in the comfortably appointed living area while he whips up a market-driven cocktail. Our welcome cocktail was inspired by the classic combination of ham and melon. Using mezcal as the base liquor gives the drink a hefty smoke that works well with the fatty funk of the salt. 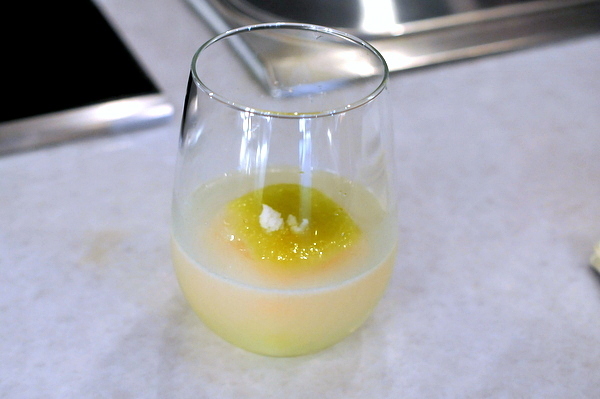 The ice cube is made from the 3 types of melon juice that has been concentrated through the use of a rotary evaporator. The drink rewards the patient as the dry woody elements of the mezcal are slowly countered by the addition of ultra-saccarine melon juice. This was the first of two snacks the kitchen presented as we sipped our cocktails. 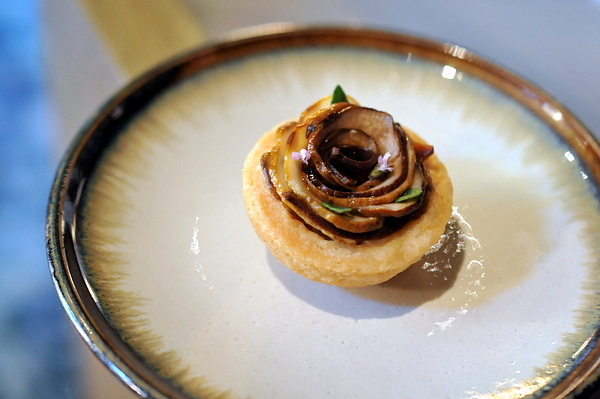 The tart crust was surprisingly dense but with a pointed butteriness that played well with the one-two punch of earthiness from the abalone and mushrooms. 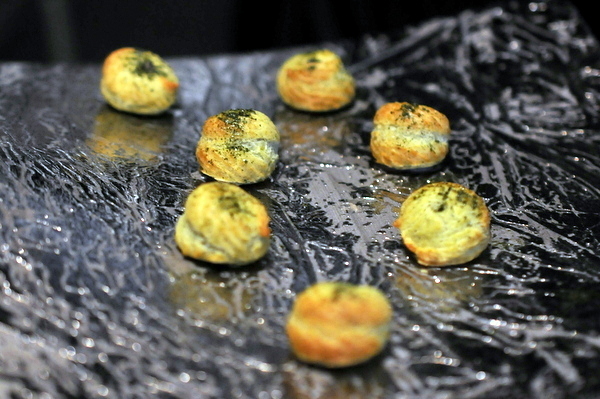 Our second morsel was a classic gougere twisted with a dusting of saline nori and finishing with lingering onion-y flavor from the ramps. Like most restaurants, Rogue offers a wine pairing with their tasting menu but here it comes with one unique feature: it's bottomless! 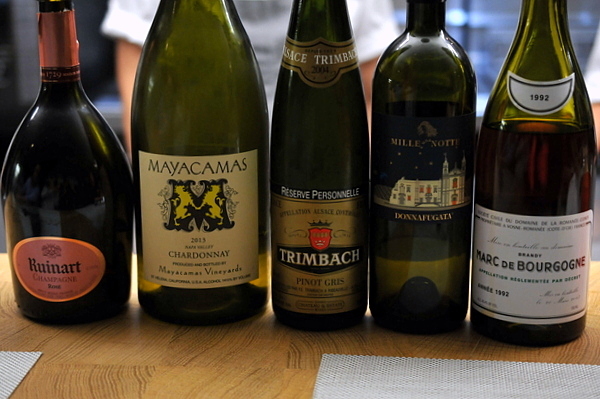 Given the meal is limited to a maximum of 8 guests, it makes sense to open a limited number of bottles and allow the diners to drink their fill. While this means lightweights can't split a wine pairing, it does allow diners to enjoy their wine without making sure to ration it throughout multiple courses. With the snacks and drinks done with, we were given a brief tour of the kitchen before being brought to a narrow kitchen counter where the chefs whipped up delectable creations right before our eyes. 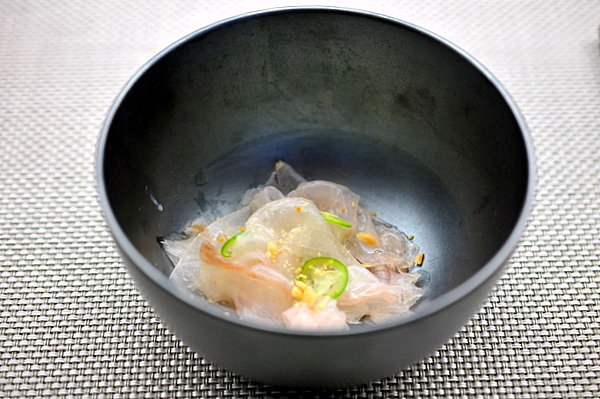 The meal kicked off with a bowl of paper thin slices of raw amberjack. The super thin slices have a markedly softer texture while the peppers and peanuts give the dish a spicy Thai-like verve. Goma Dofu is made from sesame paste instead of soy. 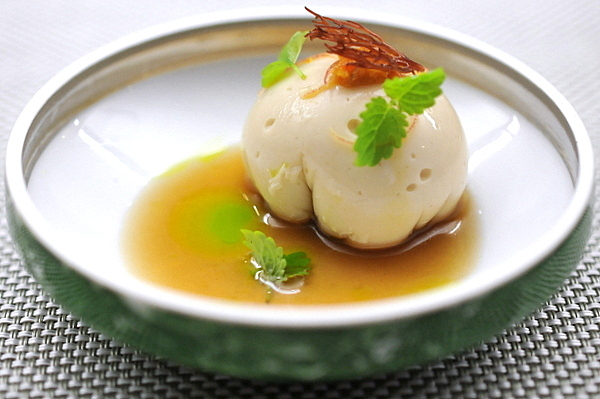 The resulting texture is slightly firmer than traditional silken tofu with a slight creaminess to boot. The use of sesame adds a slight flavor though the tofu still absorbs plenty of flavor from its companions, in this case a light savory dashi punctuated with a countervailing acidity from the citrus. This was arguably my favorite course of the night and leveraged every part of the prawn. 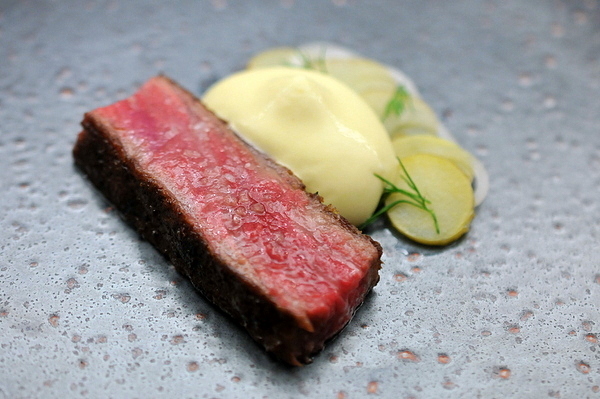 The body was served perfectly cooked in a European-style redolent of butter and pepper. The grilled rice ball had a nice bit of crunchy char and a heady saline funk from prawn innards. 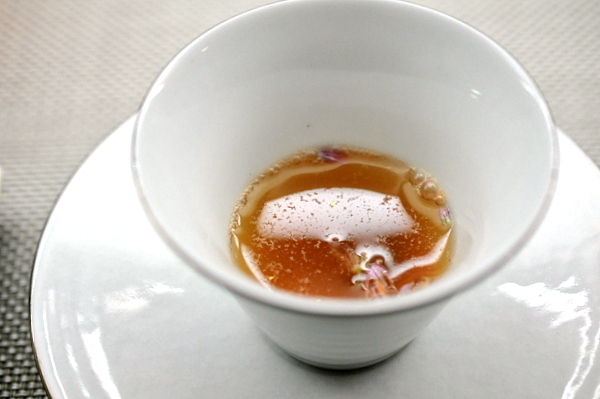 The course finishes with a dashi flavored with cherry blossom soy sauce and tinged red with powdered prawn shells. The baby avocados came fresh from the local farmer's market. 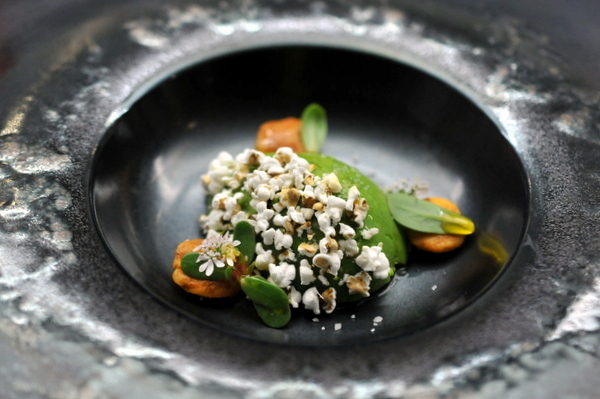 The perfectly fresh creamy avocado has a mild verdant flavor brightened by the pickled twang of the chanterelle and the toasty aroma of the puffed sorghum. 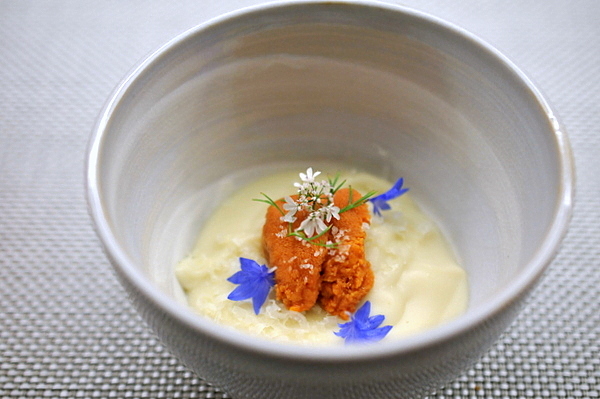 This was another of the night's standouts featuring a base of silky smooth creamed corn and a dense nugget of sea urchin roe. A light shaving of 2-year old cheddar from Fiscalini adds a bit of nutty pungency to balance the heft of the corn. The beltfish was one of the most visually appealing courses of the night. The golden brown top looked reminiscent of perfectly toasted bread. The mild white flesh is fork-tender and a delightful canvas for the playful BLT particularly the interplay between the tomato and bacon. 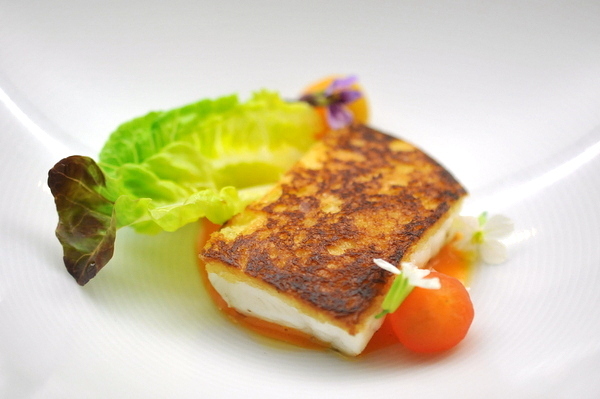 The heavier fish course uses fresh spring ingredients to create Autumnal vibe. The base was a fatty slab of spruce-smoked Sablefish. 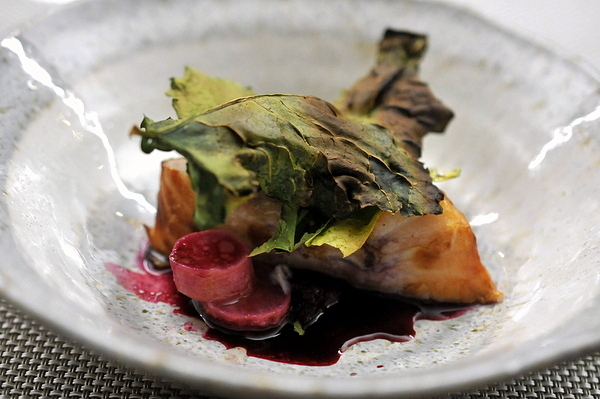 The aggressive smoke is tempered by marinated grapes designed to taste like cranberries. A course of extremes, this was a fun concept, but needed some refinement. Next up was a duo of livers. 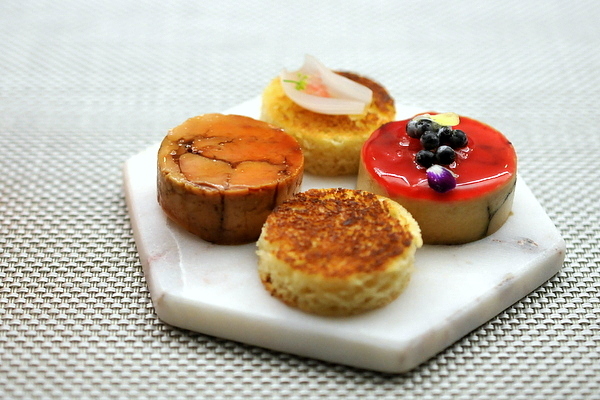 The classic foie terrine had a textbook texture and classic sweet fruit to compliment the buttery liver. 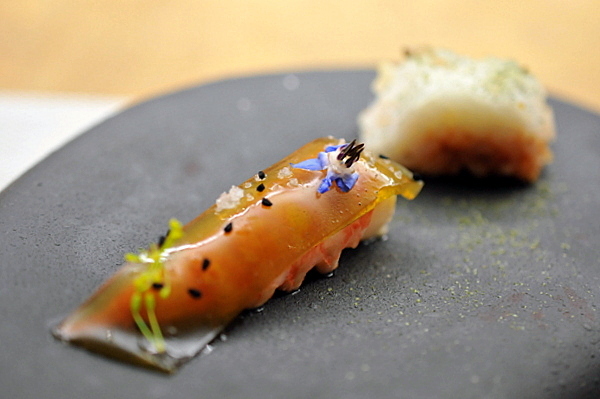 Likewise, the Ankimo was dressed with textbook flavors of sweet miso that pair well with the aggressive caviar-like salinity of the monkfish liver. The final savory of the evening was a perfectly done A5 New York strip. The seductive pink flesh is threaded with plenty of heady fat and sandwiched between two layers of perfect char. A medley of humble potato salad seasoned with dill and onion serves as a simple straightforward side lets the succulent beauty of the steak shine. 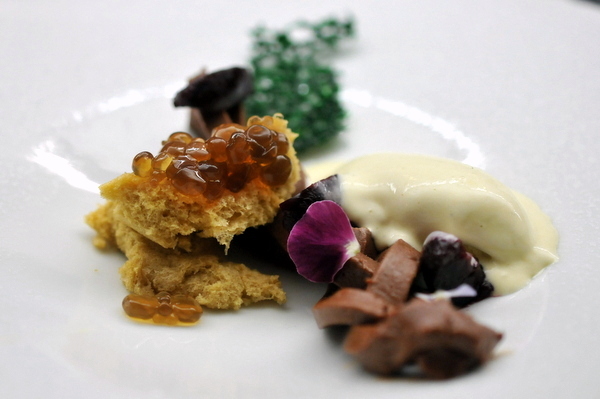 I've never run across an olive oil dessert that I didn't love and this was no different. The exotic fragrance of the olive oil is enriched with a multifaceted bouquet of fruit from the jammy apricot to the slightly astringent mulberries. 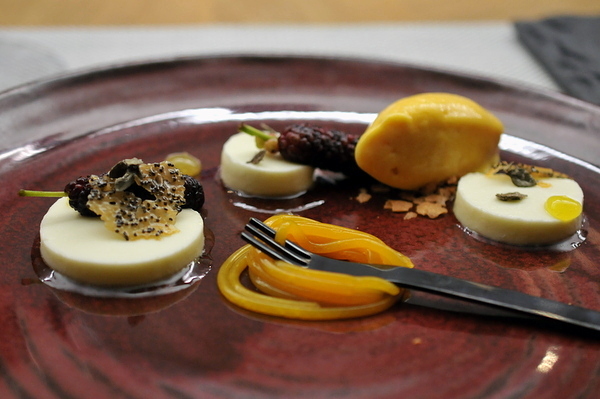 The final course was a veritable showcase of modernist techniques from the flexible ganache to the aerated brioche. Taste-wise the chocolate and cherries dominate though the dollops of jellied bourbon finish the dish with a nice boozy heat. First up was a white chocolate bonbon with lemon that tasted uncannily like a lemon starburst. 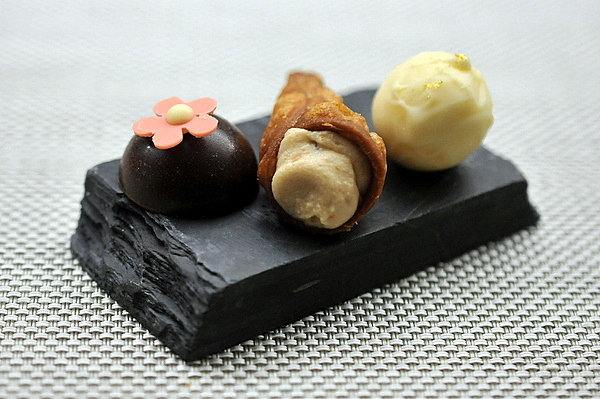 The cone consisted of classic ricotta mascarpone in a dense praline shell dusted with cinnamon. The final sweet was a dark chocolate filled with ancho that has an exotically spicy bitterness. After dinner we retired back to the demo kitchen for glasses of 1992 DRC Marc de Bourgogne brandy and China China and conversation with the Rogue crew and other guests before calling it a night. Every aspect of the Rogue Experience exudes the passion that drove the concept. With a 1-to-1 ratio between diners and guests, it seems unlikely that the restaurant will ever turn a profit, but the space wasn't designed with such base objectives in mind. Indeed the Rogue Experience is a safe space for Wolfgang and his team to push the boundaries and the resulting menu is a celebration of that creative process. The Rogue Experience is only open three nights a week with 8 seats per night so as word gets out I have no doubt it will soon become one of the city's toughest tables.